Idina Menzel & More to Appear on NOW That’s What I Call B’way! Remember, back in the day, eagerly awaiting the release of the next NOW That’s What I Call Music! cassette tape (we’re showing our age here!)? Anyway, the world’s best-selling multi-artist album series is still around and is set to drop their first ever NOW That's What I Call Broadway! on April 29. Artists to appear on the record include Tony winners Idina Menzel, Kristen Chenoweth, Michael Crawford, Jennifer Holliday and more singing from megahits such as Wicked, Annie, Beautiful: The Carole King Musical, Chicago, A Chorus Line, Dreamgirls and The Lion King. Check out the full tracklisting below! 1. “Seasons of Love” from Rent featuring the original Broadway cast. 2. “Defying Gravity” from Wicked featuring Kristen Chenoweth & Idina Menzel. 3. “All That Jazz” from Chicago featuring Chita Rivera and the original Broadway cast. 4. “On the Balcony of the Casa Rosada/Don’t Cry For Me Argentina” from Evita featuring Bob Gunton, Patti LuPone & Mandy Patinkin. 5. “The Music of the Night” from The Phantom of the Opera featuring Michael Crawford. 6. 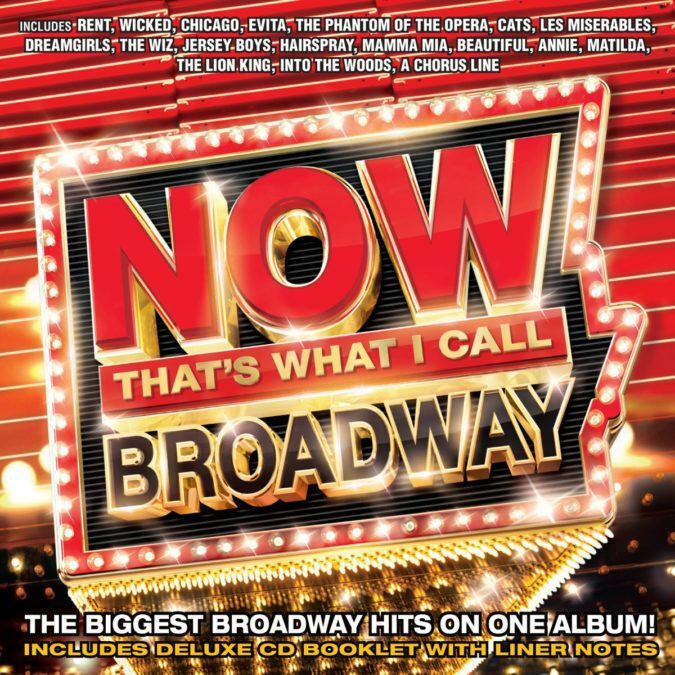 “Memory” from Cats featuring Betty Buckley. 7. “I Dreamed A Dream” from Les Misérables featuring Randy Graff. 8. “And I’m Telling You I’m Not Going” from Dreamgirls featuring Jennifer Holliday. 9. “Ease On Down the Road” from The Wiz featuring Stephanie Mills and the original Broadway cast. 10. “Sherry” from Jersey Boys featuring Christian Hoff, Daniel Reichard, J. Robert Spencer and John Lloyd Young. 11. “Mama, I'm a Big Girl Now” from Hairspray featuring Laura Bell Bundy, Kerry Butler, Harvey Fierstein, Linda Hart, Jackie Hoffman, Marissa Jaret Winokur and the original Broadway cast. 12. “Mamma Mia” from Mamma Mia! featuring Siobhan McCarthy, Nicolas Colicos, Paul Clarkson, Hilton McRae and the original London cast. 13. “Will You Love Me Tomorrow” from Beautiful: The Carole King Musical featuring Jessie Mueller. 14. “Tomorrow” from Annie featuring Andrea McArdle. 15. “When I Grow Up” from Matilda featuring Lauren Ward, Bailey Ryon and the original Broadway cast. 16. “Circle of Life” from The Lion King featuring Tsidii Le Loka and the original Broadway cast. 17. “Finale: Children will Listen” from Into the Woods featuring Bernadette Peters. 18. “One” from A Chorus Line featuring the original Broadway cast.